At 55 vehicles, this is our megaest (there’s that word again!) test ever. Here are the best new cars and bikes of the year – each of them evaluated in the most thorough and transparent way possible. We hope you enjoy reading this as much as we enjoyed putting it together. 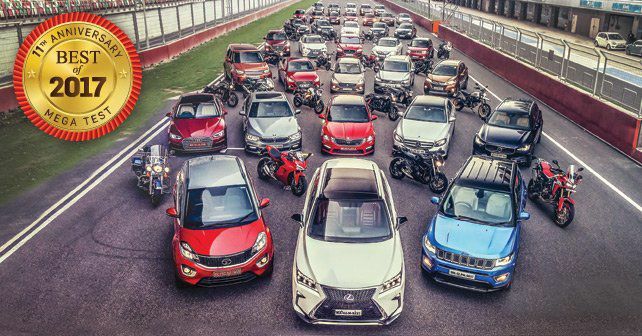 Yes, we’re back at the BIC – not merely because we enjoy pounding around in fun cars and bikes, but also because it provides a controlled environment in which to test each new vehicle that’s launched in the past year. Well, all the ones that we’re able to get our hands on anyway. We’re not just testing how fast a machine is, but also evaluating its quality, comfort, ride, handling, refinement, design, drivetrain and practicality. We make every attempt to be as transparent, objective and scientific about this as possible. But there are some subjective factors as well. For instance, X-Factor (which gets 20 points in the case of cars, and 15 points for the bikes) is that little special something that a machine brings to the table. With its heritage, the Jeep brand, for instance, has X-Factor in spades. Value for Money is one of the most important aspects in our market, and, therefore, it gets the most points – both for cars as well as bikes. Of course, it’s not just a case of giving the most inexpensive machine the greatest points – but also looking at what it offers relative to its competition. The only purely objective field is Lap Time, which gives us a uniform method to determine virtually all the dynamic factors of a vehicle, such as power, high-speed stability, handling, braking, etc. And, well, we all like to drive and ride – so this is important to us. The fastest car of the bunch was the Nissan GT-R, while the slowest was the Isuzu MU-X – the two were separated by 17.6 seconds and 15 points, which equates to .9 points per second. The four-wheel lap times were set by Editor (and part-time racer) Dhruv Behl, since he’s lapped more cars around the BIC than any other living person, while our two-wheel times were set by professional Sarath Kumar (turn the page for more on Sarath, as well as the track layout that we used this time around). parameters before the final scores are averaged to ensure that no biases come into play. Again, our aim is to be as transparent and objective as humanly possible! What does autoX stand for?